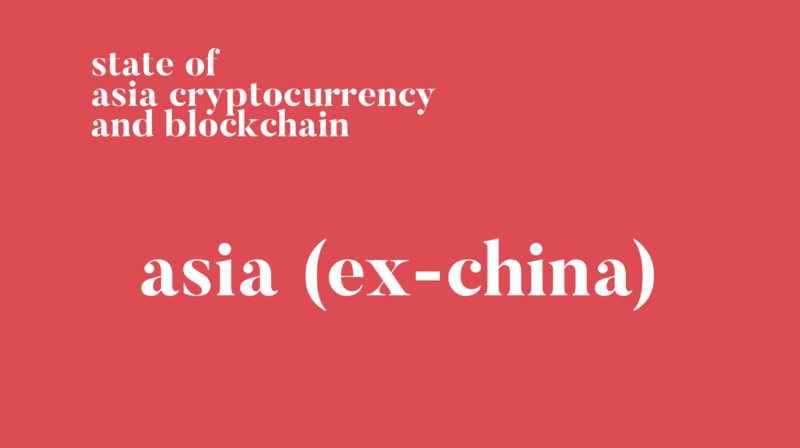 State of Japan, Korea, Singapore and Thailand- Part 2 – We help you think smartly about the crypto and blockchain landscape in Asia 5-10 years out. Check out our previous piece on China. This week, we will be discussing the latest developments in the rest of the Asian countries- Japan, Korea, Singapore, Thailand and India. Given the length of the post, we are splitting the post into several parts. This post will be on Korea and Singapore. Check out the latest post on Japan’s here. We just also released A Quick Guide to Asia Market Entry – China, Korea, Japan, Singapore and a spreadsheet detailing the data here. The Korea government has been piling on resources and promoting Blockchain adoptions and crypto trading and local exchanges are being further supported by recent regulations. Korea is trying to create its own Crypto bubble and its decisions are all pointing to improving its own state of affairs, while not necessarily engaging with crypto activities and organizations outside of Korea. A new development is that local banks are now providing virtual bank accounts to local cryptocurrency exchanges. South Korea’s Ministry of Science and ICT, and the National Election Commission said they will develop a blockchain-based online voting system by December. The government is also looking to use blockchain technology for tracing beef and providing consumers with information from the food supply chain. Cryptocurrency project ICON showcases 3 joint blockchain apps at an event supported by Seoul Government- Blockchain ID card, voting, and S-coin. The government seems very willing to dedicate resources and funds into the space. This month, the South Korean government has agreed to invest $35 million, triple that of 2018, in next year’s budget to develop blockchain technology and industry related to distributed ledger technology. Given the small Crypto community in Korea, most of the activities are happening in Seoul. On top of the government blockchain budget, Seoul has recently announced that they would create a blockchain complex to house around 200 companies as well as create a 100 billion won ($88 million) fund to foster talents in the sector. Korea’s Financial Services Commission has cleared banks to work with cryptocurrency exchanges by providing virtual bank accounts, and every bank account holder is provided with a virtual bank account by the account issuer. South Korea court has also come out and said banks cannot unfairly treat crypto exchanges. Upbit, South Korea’s largest crypto exchange by volume according to CoinMarketCap, has been approved by the Korea Internet and Security Agency for having a strong infrastructure in place. Korean crypto giant Bithumbmakes into U.S. foray with a partner to create a security token exchange. Newcomer Korean exchange Pure Bit reportedly scammed with at least 13,000 of investor Ethereum. Lastly, on the project side, South Korea’s messaging giant Kakao and Stablecoin Terra partner for blockchain payment system. Kakao Corp, amajor South Korean Internet conglomerate, has established a subsidiary of the company in Singapore to attract foreign investments with cryptocurrencies. South Korean branch of the Tezos Foundation has signed a Memorandum of Understanding with Yonsei University to collaboratively work on the development of blockchain talents. Korea’s national election commission ran an online voting system, dubbed K-voting, back in 2013, which has since been used by 5.64 million people but trust in the voting system remains low due to hacking and fraud concerns. Subsequently, the regulators are looking to deploy a blockchain voting system and are starting with a trial next month. Korea regulators have always been very vocal about the use case of blockchain and it is clear that they have high hopes for it and is not afraid of test it out. Since the beginning, Korean regulators have recognized their own technical limitations and have worked closely with the most prominent Crypto funds and projects in Korea such as Hashed and ICON, respectively. ICON is one of the largest projects in Korea, and some of its releases and roadmaps certainly demonstrate an extension of what Korea government wants to do with blockchain- Blockchain ID card, voting, etc. Recently, the ICON Team received the Korean ‘Minister of Science and ICT (MSIT) Award’ in recognition of its contributions to the development and popularization of the blockchain industry in Korea. Despite its success with the government, ICON’s lack of organization and communication with its community proves concerning. It touches on a flaw that’s shared by many local Korea projects, which is that they are perhaps somewhat too enthralled in their own country and have been neglecting the rest of their international community. This was reflected in the example when earlier this month when the ICON community found the total circulating supply of their coin increased by 18 percent overnight without any notification. ICON recognized this, apologized and decided to hire a native English speaker as Head of Institutional Markets & Contributor Relations to address this issue. But I believe this issue will continue to arise in some form or another. Lastly, but equally important, is that South Korea’s main financial authority officially cleared banks to work with crypto exchanges for the first time in history, establishing a major milestone for the local cryptocurrency sector. The formation of the Kimchi Premium, and the lack of investor protection in the cryptocurrency market throughout late 2017 and early 2018 has led me to believe that has somewhat pushed the Korea government to properly regulate the market. As long as cryptocurrency exchanges are compliant with local KYC and AML regulations, then banks are not permitted to refrain from providing banking services to trading platforms. We are still seeing an ongoing support of local exchanges, and then also Korean exchanges relatively active than others given the robustness of the crypto community there. In October, Korean Won trading volumes account for almost 50% of total market share in October. I believe this strength and trade dominance will be sustained, as Korea in the next quarter will be one of the few countries actively fostering and pushing for more exchange activity vs. the rest of the world that’s kind of stalled in this bear market. Singapore regulators and financial institutions are placing further infrastructure in place to support and regulate the crypto financial ecosystem. Under a new Singapore bill, theMonetary Authority of Singapore, the country’s central bank, has been officially recognized to oversee electronic wallets and digital payment tokens such as bitcoin. This has come about following the growing usage of cryptocurrencies and the realization that the existing legislation does not cover them adequately. Singapore Exchange has clarified the rules for publicly listed companies planning to conduct initial coin offerings. On Dec 2nd, MAS released an updated Comprehensive Guide to ICO Legality– lists eleven possible types of token, all with different obligations as well. An automated Delivery versus Payment platform has been jointly developed by the MAS and the Singapore Exchange, with the purpose to allow the settlement of tokenized securities across various blockchain platforms. Temasek Holdings, Singapore’s state investment firm, is setting up new groups to explore opportunities in artificial intelligence and blockchain technologies. ; the firm has also invested in enterprise blockchain software firm and global banking consortium R3. Currently, we are seeing regulators and financial institutions placing further infrastructure in place to support and regulate the ecosystem. The new bill to be signed has demonstrated that the MAS will have stricter standards with payment services dealing in cryptocurrencies. While other payment service providers will have up to 12 months to comply once the bill is signed into law, providers of digital payment tokens will only have six months to ensure compliance. MAS’s newly updated guideline listing out various scenarios of ICO rules is also a demonstration of the regulators’ ability to catch up on the changing landscape. Singapore Exchange is also laying out further guidelines. It has declared that any company planning to hold an ICO is required to consult with SGX RegCo in advance, as well as provide a legal opinion on the nature of tokens and an auditor’s opinion on how the ICO should be treated for accounting“both from “reputable” firms”. Thailand officially began to get involved with cryptocurrency in May this year with the introduction of a legal framework to managing cryptocurrencies, and brought them under the regulatory jurisdiction of the Thai Security Exchange Commission (SEC). The country has been building the financial regulatory infrastructure since, and other foreign entities from Asia and abroad are seeing the potential here to further blockchain advancements and crypto adoption. In the last month, Thailand SEC head had suggested that the first ICO ‘portal’ via new regulation will be approved, and that ICOs themselves could also start seeing official approval to serve Thai markets as soon as December. An update form the Bank of Thailand governor is that they will not be producing a no central bank digital currency within 3–5 years, given the complexity of creating such product. Foreign companies are identifying Thailand as a potential market. One of the largest South Korean exchanges Upbit expands into Thailand and Indonesia. The Thai branch of U.S. global IT company IBM will promote blockchain and artificial intelligence in order to turn the country into a major sales hub in the surrounding region. It remains to be seen what will happen in Thailand, but they will likely continue to evolve their regulatory framework. The country does not have the technological and financial infrastructure and adoption in place to go for a stablecoin like what we saw in Korea or Japan, but they are certainly looking to attract foreign talent and capital like what Singapore is doing. Thailand’s economy historically has been driven by exports — industrial and service sectors are the main sectors in the Thai gross domestic product, with the former accounting for 39.2 percent of GDP. Now we are seeing that Thai regulators are setting frameworks for ICOs, and it’s looking to have crypto exchange activities and blockchain technology to complement its economy. It is doing so by welcoming Upbit and IBM to allow crypto transactions and blockchain developments to foster. At the moment of writing, one dealer and six crypto exchanges have received approval for operating in Thailand as the regulatory bodies ongoingly review their applications. We do not see too many native crypto projects coming out of the country, although there is certainly a handful. The regulators have engaged in dialogue with numerous foreign blockchain projects like Ethereum and OmiseGo, but it seems like they are taking a pretty conservative approach in allowing cryptocurrencies to ICO locally. SEC said they would remain risk-averse to market entrants, and Thailand’s Deputy Prime Minister urged that additional measures be introduced both domestically and internationally to the pending regulatory framework, in order to keep up with new tactics and threats to consumer security. The government of India may provide clarity on cryptocurrency regulation as soon as next month with a new draft bill now in the works. But in the meanwhile, Indian official suggests ban on ‘private Cryptocurrencies’ prior to supreme court decision. India has a love and hate relationship with blockchain and cryptocurrency. The regulators have been stalling on the cryptocurrencies decision, fearing its financial risk and uncertainty. But at the same time, the country is well equipped for potential large-scale cryptocurrencyadoption- it has a large population of educated, English speaking, and tech-savvy citizens, as it has long been a major exporter of IT services, Business Process Outsourcing (BPO) services, and software services. And we are seeing that with large software service firms like EY and Consensys hiring and building out teams there to work on the blockchain. Nevertheless, the bottleneck has not just been on the regulators’ side but also on the education side. We are seeing signs of lack of regulations and crypto education with scams and hacks still happening. As the Indian regulators try to decide on what they should adopt and regulate, they will continue to gravitate towards enterprises software services to serve themselves and outside customers, as that has been what they know the best. It feels like it will take a pretty long time for the financial infrastructure and regulation to be fully fleshed out, and they may be a late adopter here vs the rest of the other Asia peers.